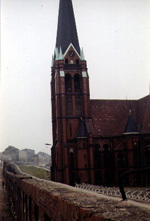 This church was trapped in no-man's-land! Machine guns in pill boxes and observation towers: the face of Soviet Communism. 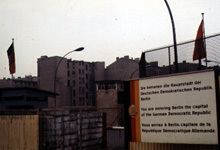 "You are entering Berlin, the Capitol of the German Democratic Republic,"
Six photos by Bruce Ford. Abandoned buildings in the "death strip." German language caption: "Spionage-Tunnel freigelegt. Erinnerung an den Kalten Krieg: David E. Murphy (l.) und Sergej A. Kondraschow in der Tunnelröhre des CIA, 23.09.97." In English that caption reads "Spy tunnel opened. Memory of the Cold War: ... in the tunnel hole of the CIA, September 23, 1997. 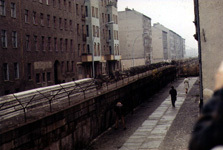 The source of this photo is the website of "Berlin-Bildarchiv." 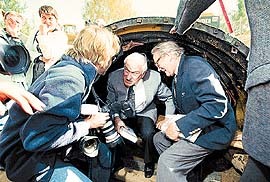 This Berlin news photo of the opening of a once heavily travelled CIA spy tunnel illustrates the high intensity of spy activity that went on in Berlin. It is an example of low-tech intelligence, used since pre-historic times, used in Berlin, and still used today in places like the demilitarized zone between North and South Korea. 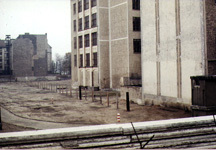 It was in one of the buildings at Site 1, Rudow, Berlin, pictured on our 2nd "Sites" photo page. The building was off limits to ASA folks there at the time, to whom it was made VERY clear, it was claimed, that if ever they were caught in the building, Shemya would look like paradise compared to their destination. There is a relatively recent book out by two unlikely authors, Murphy and Kondraschev, called "Battleground Berlin." It gives a very detailed account of CIA and KGB activities in the city from 1945 to 1961. It has a complete chapter on the tunnel and all the related data. Another book on the CIA, "The Agency, "gives references to it, also. So does "CIABASE." But none of those mention the ASA presence in Berlin.